I’ve needed a new backpack for a while but there is one thing that keeps me holding on to my bright, orange, functional yet non-functional, over-sized backpack- It was my dad’s! He got it when he was 20 years old (I will not mention his age but let’s just say he resembles Steve Martin). I’m not sure where he got it but I know he used it well- none of the zippers are functioning and the bottom gives out. The only thing that does work is the flap where it ties down and the frame. I’ve spent many trips with this backpack and it has never led me down the wrong trail. Now, after 2 years, it’s time to spread my camping wings and graduate to the next level- a functional backpacking backpack! I can not be more excited to use her this weekend! 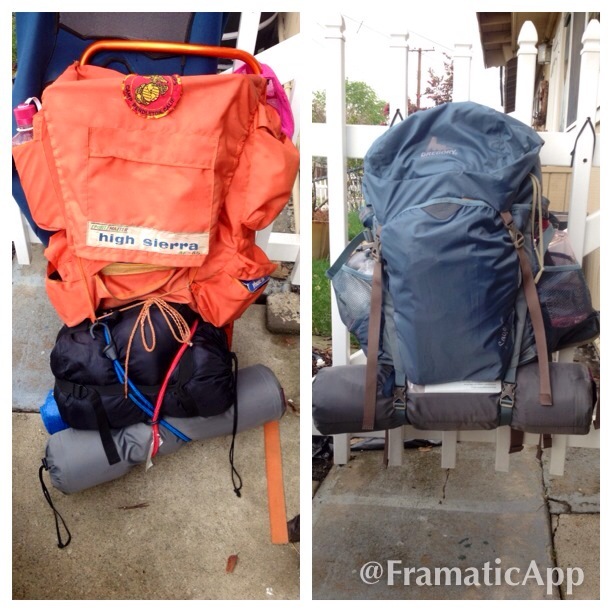 This Gregory pack is a 55 liter pack perfect for overnight adventures! Aw I know your pain! A pack is an extremely personal thing, hell, it’s your home for however long you are travelling for, how could it not be? I still use my old military Bergen, it’s been with me for over ten years now and has seen me through more adventures than I can recount! I know it isn’t the most practical, or comfortable, and there are much ‘technically better’ backpacking packs on the market (but show me one that’s grenade proof!) I have thought about buying a new one for a few years now but I just can’t bring myself to. There is just too much history and connection with the pack I have now! I’m not looking forward to the day my pack disintegrates from time and sheer wear and I HAVE to buy another! I hope you enjoy – and get as much use out of – your new pack as much as you did your old one! That is a great story of not just passing down gear from generation to generation but clearly love of getting out there was passed down as well. You just might be able to hang a new bag on that frame if you wanted to give it new life. Good luck with the Gregory. Mrs Stranger and I have been out shopping for her and she tried on a few. They do make nice packs. This is the pack my husband has. It’s a good one for sure. I hate to think of the day that I’ll have to retire my old north face pack, but I doubt my daughters will ever be able to use it. The torso is a bit long, but who knows they may end up exceptionally tall and use my pack for many years onward. It’s a sad day to leave something like that behind, I hope the new pack is ready for another few decades of memories for you and your family! I actually had it since I was 15 – – even longer ago!!!!!!!!!!!!!!!! Yep–I’ve had to do the same…feels like a real end of era moment…Now I soon have to replace my boots, which have trekked in the mountains of the West, sands of Afghanistan, mud of Central America, and over the Himalaya…I dunno if I can really do it! Nice to see that things are actually being used and not just “tested” and sold or thrown away…!